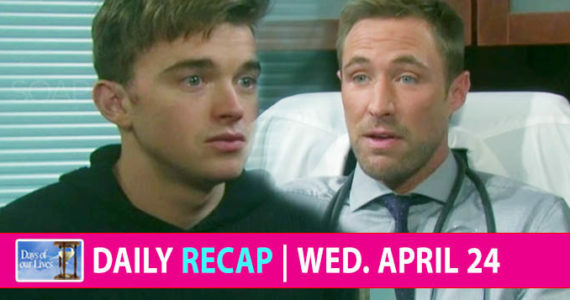 Days of our Lives spoilers (DAYS) teasers for September 3-14 promise shocking jaw-droppers, stunning confessions, and absolute regret in Salem. Get ready for an action-packed two weeks! Watch Paul fight for his life, Eli fight his feelings and John fight the overwhelming worry that envelopes him. Get the day-to-day teasers and prepare to watch Salem charge into fall. Days of our Lives airs weekdays on NBC. Check your local listing for air times. Paul’s life hangs in the balance. Will and Sonny’s plans for the future hit a snag. Kayla receives upsetting news about Steve. Kristen turns to someone unexpected for help. John anxiously waits for Marlena to wake up post-surgery. Abigail confides in JJ she thinks Gabi is out to get her. Stefan is faced with a tough choice. Lani and Eli have a close moment while working together. John finds Marlena in crisis as Valerie tries to save her life. Brady blasts Will when he overhears him declare his love for Sonny. Eli confesses his feelings to Lani. Gabi and Abigail have a major confrontation. Eric and Brady try to support John, who’s deeply concerned about Marlena’s condition. Belle shares stunning news with Eric about their mother. Will tells Paul he’s gotten his memory back.